Fancy an exotic escape? This heavenly scented Coconut & Lychee shampoo nourishes your hair and adds shine. This shampoo has been especially formulated to delicately cleanse your hair, leaving your scalp purified and invigorated. Uses most of the same ingredients you'll find in higher priced brands, but at a great price which means you can afford to look glamorous every day! Best for all hair types! How to use: Wet hair, use a good size dollop of shampoo, lather then rinse thoroughly. Have you also tried our Alberto Balsam Tea Tree Tingle Conditioner? 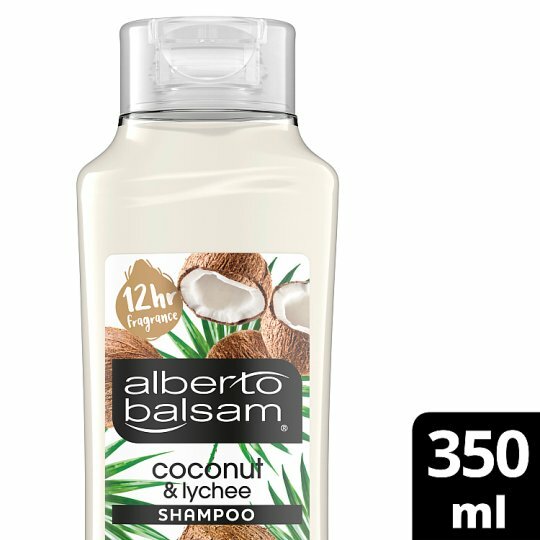 Alberto Balsam has been providing excellent affordable family shampoo & conditioner to UK families for generations. Over the years, we've learnt to celebrate all the small things that make life beautiful. That's why we use delicious natural ingredients, like raspberry, coconut, blueberry and apple in our products to give you little moments of joy with their lovely fragrances. Hair smells as good as it feels! Our extensive range of fresh ‘n’ fruity fragrances means that everyone in the family will be able to find their perfect Alberto Balsam shampoo scent, for a fantastically fragrant in-wash experience and delicious smelling hair. The perfect family conditioner! With strengthening pro vitamin B5.